Golden Door Resort donates 100% of profits to non-profits helping women and children. Andréa R. Vaucher, Journalist, Author, Media Specialist. World traveler, spiritual warrior, yogi, paddle boarder. The General Manager of the Golden Door, the exclusive spa resort in North San Diego County, California, hasn’t slept well. Kathy Van Ness just crossed the country on the red-eye to Florida where today, in the HSN Studios, she’ll pitch the Golden Door line of skin and hair products and introduce viewers to cookies and jams made from the resort’s famous recipes. There is also honey from the Golden Door hives and soon pasta sauce from Golden Door tomatoes grown on the hotel’s 220 acres of bio-dynamic gardens. Van Ness is psyched. Now, if you can’t take the time or have the money to spend a week at the Golden Door, there’s another way to bask in its glow. Savor a to-die-for ginger cookie. Quench your hair with their Hinoki shampoo. And, in the tradition of Paul Newman, who famously said in 1982 “let’s give it all away” about profits from his Newsman’s Own foods, 100% of all Golden Door profits, whether from products or hotel stays, goes to non-profits that help women and children. Starting with local organizations in the San Diego area — in the same way the food for Chef Greg Frye’s kitchen is first sourced locally — and then fanning out across the globe. “Doing the right thing” has always been part of the Golden Door’s DNA. 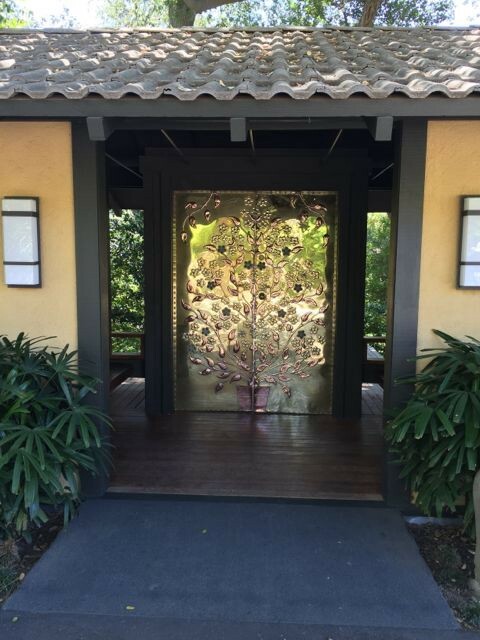 The original Golden Door, created by Deborah Szekely and her health fanatic husband, was an upscale version of Rancho La Puerta, the funky “fat farm” they started in Tecate Mexico at the outbreak of World War II, when cigarettes were as ubiquitous as cell phones are today, way before health and wellness were part of the collective consciousness. In its heyday, the Golden Door was the place for Hollywood stars like Burt Lancaster, Johnny Weissmuller Marilyn Monroe, Elizabeth Taylor and Natalie Wood to hide away and lose the “the extra 10” the camera puts on. Eventually Szekely sold the hotel, which under corporate ownership languished. The famous name was licensed, with generic Golden Door spas springing up in Vegas, Florida and on cruise shops. Soon guests who had been coming yearly for decades — first with their mothers and now with their daughters — hardly recognized the place. One of those repeat guests, Joanne Conway, whose husband, Bill Conway, founded The Carlyle Group, bought the place in 2012 for $24.8 million. She hired Van Ness, who had run mega-fashion firms like Diane Von Furstenberg and Speedo, to apply her business and branding savvy to this legacy spa property that accommodates only 40 guests at a time. Once Van Ness got the Golden Door name back, she set out re-establishing the brand. The revamped resort is pristine, its 40-individual rooms spread out over the lush, verdant property with its koi ponds, waterfalls, Japanese gardens and 50-miles of hiking trails. There are yoga rooms and four gyms and guests have daily massages, facials and work-outs with a personal trainer. But meals are the highlights — the guests LOVE the food, much of which comes from the resort’s gardens. “At every turn — from the farm-to-table food, the aura of blessed well-being among the staff, the pervasive sense of honoring the land, the water and the air through sustainable practices — we felt part of something worthy, and enduring,” says Rachel Bellow, who recently spent four days at the Golden Door with her business partner, Suzanne Muchin. Bellow and Muchin, who co-founded Mind + Matter Studio, a strategy consulting firm that specializes in social purpose branding, even recorded a podcast while at the Golden Door about working during vacation. Though Conway and Van Ness are thrilled to be contributing to the well-being of their guests — who, these days, are generally looking to rid themselves of stress rather than pounds — what they are most proud of is the work they are doing with the Golden Door Foundation. And, for now, Van Ness doesn’t mind giving up a little shut-eye if it means creating new money streams and eventually giving more away. The author has no affiliation with the Golden Door. Andréa R. Vaucher's articles about the arts, travel, style and spirituality have appeared in The New York Times, the Los Angeles Times, the Washington Post and Tricycle, among other international publications. She is the author of Muses From Chaos and Ash: AIDS, Artists and Art (Grove Press) and the recipient of Visit California's 2013 Eureka! Award for Best Digital Feature for her Huffington Post blog: Los Angeles to San Francisco: From Goat Cheese to Gaultier.